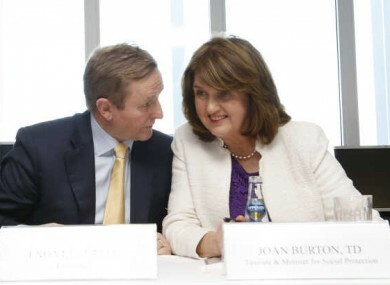 THE LATEST OPINION poll shows a drop in support for Fine Gael, but a rise for Labour. The Red C poll for the Sunday Business Post shows a one point decline in support for Fine Gael (29%) and a two point drop for Fianna Fail (17%) while Labour and independents have managed a small gain. Labour has reached the 10% level for the first time since last September, up one point from the most recent poll earlier this month. Support for Independents and others is up 2% which puts them at 25%, while Sinn Féin remains unchanged at 19%. This is the second hit in the polls for Fine Gael since Christmas – despite its numbers having recovered significantly in the latter half of 2015 – with the party dropping three points in the last fortnight. It’s now particularly concerning for the party given that a three-week general election campaign is expected to be announced this week. Based on these figures, the government parties need to gain significant support during the campaign in order to be re-elected. Support for independents and small parties has risen by two points to 25%. Most of the increase in support for independent and small parties went to independent candidates who are on 16%. The poll shows that support for the Anti-Austerity Alliance-People Before Profit group is on 3%, the Social Democrats are on 2%, Greens 3% and Renua 1%. The poll was carried out among 1,000 votes last Monday, Tuesday and Wednesday. Email “There's bad news for Fine Gael but Labour has gained in the latest poll ”. Feedback on “There's bad news for Fine Gael but Labour has gained in the latest poll ”.